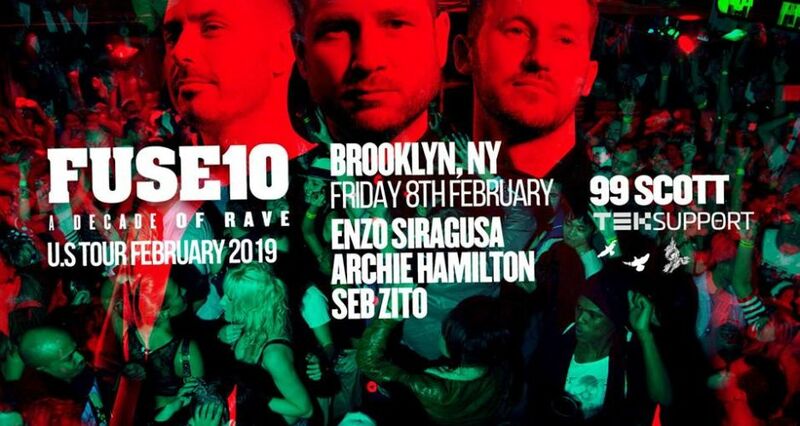 FUSE is ever evolving, and following a string of sold-out shows in the UK celebrating 10 years of the brand, they head to the US to kick off the 2019 international tour with founder Enzo Siragusa, Archie Hamilton, and Seb Zito. The success of FUSE can largely be attributed to its evolution. In 2008 they sprung into the heart of London’s minimal scene, throwing weekly parties on Sunday that proved to be pivotal for the brand. After ten years of operation, FUSE has grown to be one of the capital’s most prominent party brands and labels and are celebrated across Europe for delivering outstanding events wherever they choose to land. They have impressive residencies in A-list Ibiza venues, including Sankeys, Space, and Amnesia. FUSE also boasts annual events at ADE, Off Week and Sonus Festival. As if their resume needed more buffing, the brand is catapulting in the United States for their global 2019 FUSE10 tour. Brand founder, Enzo Siragusa, says, "The 10 years of FUSE tour in the UK has been incredibly humbling and special. Witnessing the love for our party and sound and how far we have come has further fueled my inspiration to take FUSE into the next 10 years. Wherever we go we deliver stand out events with an undeniable vibe that has become synonymous with FUSE and I know we will transmit it to the clubs we have carefully chosen to make our US debut." After touring the US individually, Enzo, Archie, and Seb have a solid fanbase in the States and are delighted to bring that famous yet ever-evolving FUSE sound and vibe across the pond.